In the spirit of Halloween I have included my Top 10 Halloween themed Sensory Activities. These Halloween activities are for all ages. Younger participants might however require some assistance from an adult. Have fun! Equipment needed: Jell-O and any small Halloween related creatures or objects. Dollar stores are great to get stocked up. First make the Jell-O according to the instructions on the packet. Before it sets, you should place your objects into the Jell-O. You can choose to cool it in a shallow container. This will help spread the light weight objects that tend to float to the top. You can also choose to cool off the Jell-O in layers. This will ensure that all the objects are spread out throughout the entire Jell-0. Once cooled, place the Jell-O onto a tray. Then, let your child’s hands or feet explore and find all the hidden Halloween objects. Pick up Halloween objects that can be incorporated into the fun play. Many stores have great collections of googly eyes, bugs, ghosts, skeletons, bats etc. Have some fun hiding objects into the mash. They can include googly eyes, or small plastic bugs. Once everything is well hidden they can start digging through it and pull them all out. Some kids may enjoy creating Halloween themed objects from the play dough. Kids can make a ghost, spider, spider web, pumpkin or anything else related to Halloween. Take out your toy utensil and plate set and have some fun creating a spooky dinner from all the mash. Maybe some eyeballs & worms are on the menu or crispy fingers. Let your imagination run wild. See how many different monsters your child can make. You can use googly eyes, pipe cleaners, wiki stix etc . If after a few minutes of kneading it’s still sticky then keep adding small amounts of flour. Keep adding until you have reached perfect play dough consistency. 3. Haunted House: Indoor obstacle course with the use of the flashlight. Equipment needed: This list is flexible. You can pull out pillows, cushions, blankets, tables, chairs and boxes. If available, you can hang up bats, spiders or ghosts to add to the spooky feeling. When setting up an obstacle course, try to match its complexity to your child’s skill level. Make sure there is some challenge to improve on their skills while keeping it fun. Obstacle courses are a great opportunity to work on concepts such as under, over, through, in and out. Try to give the obstacle course a purpose. This could be a rescue mission. Your child’s toys have been taken and hidden all around the ‘haunted house’. It is their mission to find them all. The obstacle course should give your child the opportunity to walk on uneven surfaces (blankets, pillows), crawl or climb up and down (couches or tables). You can use yourself as a sleeping zombie and once climbed on, you can turn into a tickle monster! Get your child to crawl under the tables or through tunnels made from hanging sheets or open boxes. They can also climb in and out of boxes. Maybe create a spider web. You can use yarn to create it and your child has to maneuver through it and be careful not to get caught by the spider. First complete the course in daylight. Once the daylight obstacle course has been mastered, you can repeat it in the dark. You can use a flashlight to help guide their way. Have fun! To stay within the Halloween theme first we need to make some spooky bowling pins. Equipment needed: Empty soda bottles or aluminum cans, construction paper of various colors, marker and glue. To make a spooky bowling set you should first decide what your bowling pins are going to be. Is it going to be a zombie, a ghost, a jack-o’-lantern, a witch etc. Then start decorating and voila!! Once the spooky bowling pins are made, you can play bowling. There are various ways to play bowling. Don’t only get stuck on the traditional bowling strategy. Try knocking down the pins while lying down or kicking with your feet. What about standing backwards, bending down and while your head is between your knees roll the ball to knock the pins down. This is a game through which another texture can be explored. Once you complete the slime (see below recipe) hide some plastic spiders in it. Your child can explore the slime by pulling out the spiders. Then they can continue to explore and experiment with its texture. In a small container add borax powder to 1 cup of warm water and stir to dissolve. Set aside. In a separate container pour glue and add 1/2 cup of water. Add a few drops of food coloring until desired color is reached and then stir to mix glue solution until smooth. Pour the borax mixture into the glue mixture. As you stir you will notice solids start to form. After a few moments you can use your hands to gather the mass. The mixture will initially be very soft and wet. Keep kneading until it firms up and feels dry. Discard excess liquid from your container. The more you knead the slime the firmer it will become. Equipment: Large container of water, Halloween decorations (eyeballs, bugs, spiders), dirt or flour, rice, noodles, glitter, spoons, ladles or whatever your child decides he wants to play with in the water bath. Anything goes. A particular favorite is an ice cube in the water bath. To add to the spooky factor you can use food coloring to change color of the frozen water and maybe freeze a bug or two. This can be a very open ended activity. Follow your child’s lead and present some guidance if they feel stuck. Some ideas include: pouring witch’s brew from one container to the next, fishing out bugs or eyeballs. You can make a more interesting concoction by adding glitter, flour, dirt, rice or anything that your kitchen can spare. Depending on the age and skill of your child they may be able to do either part or a whole activity. Step 1: Create a Jack-o’-lantern face on the pumpkin using tape. Step 2: Make your drip paint. See below recipe. In a small bowl mix flour and salt together. Once combined add water. Mix until all ingredients are combined. Divide the mixture between 4 zip lock bags, then add food coloring to each. Step 3. Now it’s time to transform your pumpkin. Cut a small hole on the end of the zip lock bag and drip the paint over the pumpkin. You will notice the paint oozing from the bag. Repeat with each color. The thicker it is dripped on, the longer it will take to dry. Step 4. Once dried, remove the tape to reveal the Jack-o’-Lantern. Fine motor, bilateral integration (us of two hands) and hand eye coordination. Proprioception, tactile and visual senses. Equipment: Black and orange construction paper, white crayon and glue. Depending on the age and skill of your child they may be able to do either part or the whole activity. Step 1: Using the white crayon draw a Jack-o’-Lantern on the black construction paper. Step 2: Cut the orange construction paper into ½ inch strips. Step 3: Your child should tear the orange strips and then paste them onto the pumpkin. Pumpkin Decorations: Anything goes here. Glitter, paint, tissue paper, feathers, golf tee etc. This is aimed to be an open ended activity. Give your child all the decorations and let their creation appear. For extra challenge and hand strengthening you can use some golf tees. Your child can grab a toy hammer and hammer them into the pumpkin. It can be a funky hair design. Fine motor skills, bilateral integration (use of two hands) and hand eye coordination. Proprioception, visual and tactile senses. Equipment: White paper, white crayon, dark water paint and a paintbrush. 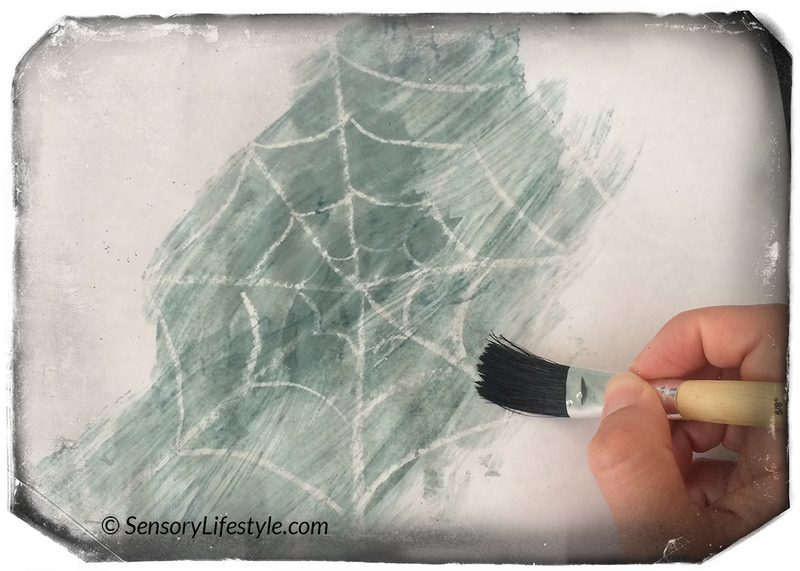 Step 1: Use the white crayon to draw a spider web on the white paper. It will be very hard to see. Depending on your child’s skill level you may provide them with some direction or an example. Step 2: Now it’s time to paint the picture and watch the spider web appear. 11. Going to a Pumpkin Patch? When at the Pumpkin Patch, encourage your child to lift and carry a variety of pumpkins. These are great heavy work activities supporting the proprioceptive sensory system. Balance, motor planning (ability to conceptualize, plan and carry out an unfamiliar task), body awareness, bilateral coordination, hand, arm and shoulder strength, core strength, trunk control and visual skills such as scanning. Vestibular, tactile, proprioceptive and visual senses. Simply as they explore the pumpkin patch let them play with the pumpkins. They can lift, carry or push a wheelbarrow full of pumpkins. Anything goes. There you have it. My top 10 Halloween Sensory Activities. These are bound to spark up other ideas. Let me know what activities you have tried in the comments section below. Happy Halloween! Disclaimer: Adult supervision is recommended for every activity on this blog. All activities are to be performed at your own risk.